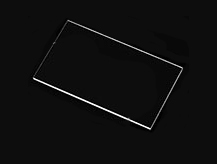 Glass slides made from fine white glass, with ground and polished edges. 72 slides to a box. 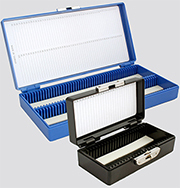 Designed for safely storing petrographic slides long term and also for transport. Made from durable ABS plastic with a hinged lid, secure latch, and foam base. Available in 2 sizes and colors; able to be stacked. Formulated specifically for the preparation of petrographic thin sections, EMS Petrographic Epoxy Kits are the only epoxy mounting medium which is supplied with everything needed to dispense, mix and apply the medium. No more guessing at proportions, and improvising stirring rods and mixing containers. EMS Petrographic Epoxy is the only epoxy based mounting medium with this refractive index, which is considered ideal for general petrography. In addition, EMS Petrographic Epoxy is the only mounting medium for which the refractive index is given and warranted to four significant figures. Many manufacturers of mounting media give no refractive index information at all, and of those that do, some are wrong. A mounting medium of known refractive index can be a powerful aid in mineral identification. For example, a medium of 1.540 is useful for distinguishing between feldspars. In addition, the relief of a mineral is, in part, dependent on the r.i. of the cover glass mounting medium. Particularly when scanning a slide at low power, the difference in the relief of various minerals can be a valuable aid in mineral and texture determination. For almost all rocks and minerals, the EMS Petrographic Epoxy bond to unfrosted slides is stronger than either the specimen or the slide. Therefore, slides need not be frosted, which saves a production step and eliminates attendant refraction and consequent poor image at high contrast, as, for example, when observing the Becke line. This tremendous strength allows you to saw and rough grind a much thinner section than with any other mounting medium. Remounting of specimens due to plucking and bond separation is virtually eliminated. Once the two EMS Petrographic Epoxy components are mixed, the pot life of EMS Petrographic Epoxy is about 5 days at 21°C (70°F). This eliminates waste due to the rapid gelation (0.5 to 3 hours for all other epoxy mounting media) of unused mixed material. And you won't spend up to 1 hour per week constantly mixing epoxies. With EMS Petrographic Epoxy, you mix the two components as infrequently as once per week - for 5 minutes. In addition, the long pot life of EMS Petrographic Epoxy frees you from having to organize your time so that several specimens can be mounted or covered at the same time. Mounting only one or two sections with EMS Petrographic Epoxy is both convenient and efficient. Cure time for a high strength bond is only 10 minutes, a tremendous time saver. Optimum cure temperature is 135°C (275°F). The low viscosity of EMS Petrographic Epoxy provides excellent penetration during impregnation and specimen mounting. Because of its low viscosity and long pot life, applying cover glasses with EMS Petrographic Epoxy is faster, easier, and simpler than with any other mounting medium. EMS Petrographic Epoxy is a 100% solids system - there are no solvents to vaporize; and there are no by-products of the cure reaction. Therefore, no bubbles will form under the cover glass during cure. 10 mg Blue Dye per 1 ml EMS Petrographic Epoxy Resin will give a light transparent blue in a 30 micron section. 20 mg/ml will give a bright transparent blue.